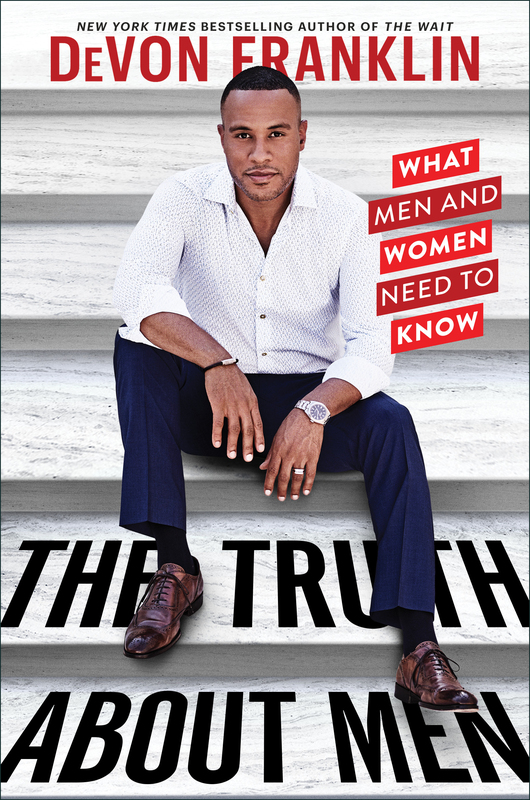 The word “timely” is thrown around a lot, but when it comes to DeVon Franklin’s latest book, it’s an earned descriptor: The Truth About Men: What Men and Women Need to Know is an extremely timely book. Franklin is a pastor and Hollywood producer and in recent years has made a considerable impact with his two bestselling books, “The Wait” and “The Hollywood Commandments.” While he was touring for his most recent book, he was interviewed by Maria Shriver for her Facebook show, Architects of Change, and after the interview, he off-handedly mentioned that he had a new idea for a book, one inspired by the recent Harvey Weinstein scandal and the #MeToo movement. Franklin felt that someone needed to address what was going on inside these men, inside all men, and offer solutions to widespread, deeply entrenched issues. And to that, Shriver said, “You must write this book, right now!” So he did. The Truth About Men (on shelves February 5) is timely not because it presents us with groundbreaking new ideas, but because it meets us where we are, right here, right now, in 2019. With candor and transparency, Franklin tackles two of the most pressing questions for men in the era of #MeToo and #TimesUp: “What is going on inside men?” and “Is something wrong with us?” Franklin’s original title for the book was, Are Men Really Dogs?, a question he became fascinated with long before Weinstein and Spacey and Louis C.K., having experienced firsthand the effects of his father’s marital infidelity. Growing up, he writes in the introduction, men being dogs was presented as a “fundamental law of the universe.” For Franklin, then, this is more than an academic exploration. As a son, father and pastor, he wants to know: what is wrong with men? As Franklin sees it, the question is simply answered: men have a lust problem. Franklin defines lust as “an overwhelming selfish impulse for sexual, financial, professional or personal fulfillment by any means necessary, even if those means are personally, professionally or spiritually detrimental.” He calls this lust the Dog, and believes that every man has this drive within them, likening it Freud’s concept of the id: the part of the brain that is illogical, aggressive and impulse-driven. The first step for every man, Franklin argues, is recognizing that the Dog lives inside of him, and it cannot be ignored or eliminated. It can, however, be managed. This is where Franklin’s idea of the Master comes in. Within every man, Franklin writes, there is “a tug-of-war between his spirit and his flesh,” and if the flesh is the Dog, then the spirit holds the “higher man—the love, aka the Master…” The Master can train the Dog to be wiser, more loving, more gracious, more faithful. It won’t be easy. And the truth is, Franklin says, lust will never go away. But if we let the Master take control, we can be more like the men we hope to be. As Franklin sees it, the question is simply answered: men have a lust problem. Throughout the book, Franklin gives plenty of practical steps for mastering The Dog within, but most of them boil down to ways of delaying gratification. This is the problem with lust: not necessarily that we want, but that we let ourselves act upon that want. But, if we can learn to delay that gratification until it is in the right context and at the right time, we will be healthier, more whole human beings. Again, this isn’t new stuff. M. Scott Peck made the same assessment decades ago in his seminal book, “The Road Less Traveled.” He describes delaying gratification as “scheduling the pain and pleasure of life” and declared it “the only decent way to live.” Everyone from Solomon to Buddha has said as much. Perhaps that’s what makes Franklin’s book so pressing. It’s not a new message, but it’s probably the one that men most need to hear right now. The Truth About Men serves as an honest, accessible and nuanced reminder of the truths we so easily forget. And Franklin is very clear about what he is not doing. He is not claiming that the Dog can be eliminated completely or encouraging men to suppress their desires or suggesting men tough it out. No, instead, Franklin is giving men the tools to start taking control of their desires and calling upon them to let others into the process—spouses, friends, mentors, pastors and more. More than that, he is calling men to a higher standard—Mastery. Franklin says at one point, “for men to aspire to greatness, they must commit to the process of becoming great and work at it every single day.” That’s what Mastery is: a lifelong commitment to greatness. But if we let the Master take control, we can be more like the men we hope to be. The Truth About Men was not just written for those who have made enormous mistakes. It was written for all men, of every age, creed and nationality. It was written for women, too, to better understand the “tug-of-war” that rages in the heart of every man and to know how to best support and challenge the men in their lives. It’s a timely book, yes. Our culture is reckoning with desire and power and respect in a major way, and Franklin’s words are a valuable contribution to the conversation. But Franklin has also written a timeless book about ideas that are as true today as they have ever been. The questions may take different forms, but the answer remains to same—learn to love well. That is the only proper response, now and forever.